Rievaulx Abbey, England pictures, photos. Images of the ruins of Rievaulx church & monastery. Also buy on line as stock photos or photo art prints. 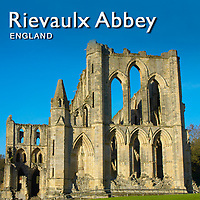 Rievaulx Abbey is a former Cistercian abbey headed by the Abbot of Rievaulx. It is located in Rievaulx , near Helmsley in North Yorkshire, England. It was one of the wealthiest abbeys in England and was dissolved by Henry VIII of England in 1538. Its ruins are a tourist attraction.